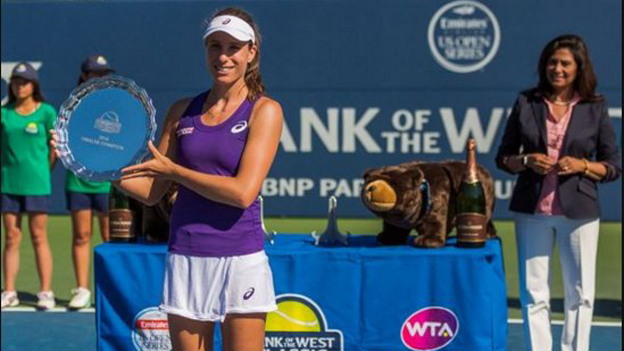 Britain's Johanna Konta beat seven-time Grand Slam champion Venus Williams to win her first WTA title in Stanford. Konta, 25, won 7-5 5-7 6-2 in California to join Heather Watson as a British winner on the WTA Tour in 2016. Sue Barker was the only previous British winner in Stanford, beating Virginia Wade in the 1977 final. British number one Konta - ranked 147th last June - will rise from 18th to a career high 14th when the new world rankings are confirmed on Monday. She reached the semi-finals of the Australian Open in January, and again at Eastbourne in June. Watson became the first Briton for 24 years to win a WTA title in Osaka four years ago, and has since added victories in Hobart (2015) and Monterrey (2016). Konta's success comes at a higher level, however, with Stanford among the WTA's 'Premier' tournaments and boasting former winners that include Martina Navratilova, Chris Evert, Monica Seles, Martina Hingis and Serena Williams. After overpowering world number 12 Dominika Cibulkova in Saturday's semi-finals, Konta looked on course for a similarly confident win at 7-5 4-1 up in the final. Williams, 36, was wobbling when she double-faulted to fall two breaks down in the second set but the five-time Wimbledon champion came storming back. With nerves gripping Konta, the American took six out of seven games to force a decider. However, it was the Briton who proved the stronger on a fiercely hot afternoon and she again forged a commanding lead i n the final set. The tension was apparent as Konta tried to serve out the match and she had to fend off three break points in a dramatic game before converting her third match point.